Buenaventura Golf Course is a par 70 layout, which plays 5,826 yards from the back tees, has a slope of 117, and has a unique combination of short and long holes. There are five par 3s on the course, four of which are 164 yards or shorter, but the par 3, 7th hole, plays 230 yards. There are also three par 5s, two of which are 450 and 464 yards, with the third being 560 yards. 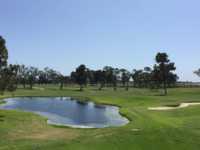 Originally designed by William Park Bell in 1932, Buenaventura Golf Course went through a $6.5 million dollar renovation in 2006, which was directed by golf course architect Forrest Richardson, and involved a complete re-routing of the course. It now has large bent grass greens, which have rolling contours, tree lined fairways with rye grass, six lakes, and many white sand bunkers. Buenaventura Golf Course discount tee times are available for those looking for cheap golf in Ventura, and many past players have had great things to say about their day at the Course, like how it was fun to play and challenging, and that they are looking forward to going back again for future Ventura tee times. Banquet and meeting facilities are available for weddings, corporate events, or any size tournaments. There is also a bar and grille restaurant to enjoy either before or after your round.